Highland County was well represented at the 2018 Ohio State Fair. Many ribbons, banners and awards were won by our 4-H members. Pictured are some of the state fair winners These individuals, along with all Highland County 4-H members, spend countless hours on their projects. Many people only recognize the animal projects however, each member has over 200 projects from which to choose. Pictured are (back row, l-r) Caden Hess, All About Beef; Sydney Shelton, All About Beef; Emma Yochum, All About Beef; Heather Burba, Marshall Stockmen; and Cameron Burkhart, Marshall Stockmen (third fow, l-r) Katie Cook, Greene Countrie Farmhands; Maddie Caldwell, Fab 5; Katelyn Chambliss, Highland County Unlimited; Kathryn Ogden, Canine Commanders; Kyah Chaney, K-9 Commanders and Fantastics; Alexis West, Marshall Jr. Farmers; and Madison Frazer, Fur, Feathers and Friends (second row, l-r) Hope Wyckoff, Barnyard Bunch; Spencer Wyckoff, Barnyard Bunch; Sydney Hamilton, Highland County Poultry, Pigs and Lambs; Claire Wilkin, Fur, Feathers, and Friends; Kelsey Thornburg, Fur, Feathers, and Friends; and Destinee Kipp, Fur, Feathers, and Friends (front row, l-r) Eve Roehm, Highland Harvesters; Leah Robinson, Marshall Stockmen; Mia Roehm, Highland Harvesters; Jayah Chaney, Fantastics; Lizzy Ogden, K-9 Commanders, Sam Hamilton, Highland County Poultry, Pigs and Lambs; Siarra Kipp, Fur, Feathers, and Friends; and Gage Thompson, Fur, Feathers and Friends. https://www.timesgazette.com/wp-content/uploads/sites/33/2018/08/web1_State-fair-kids-pic.jpgHighland County was well represented at the 2018 Ohio State Fair. Many ribbons, banners and awards were won by our 4-H members. 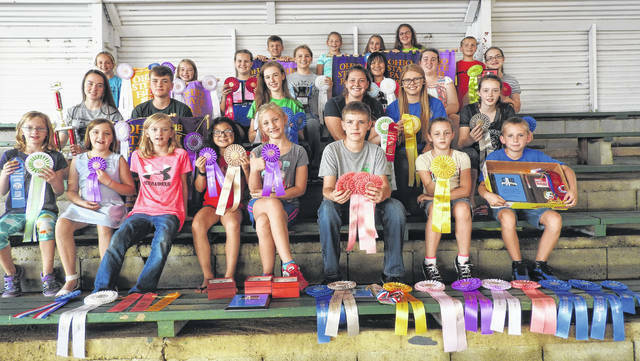 Pictured are some of the state fair winners These individuals, along with all Highland County 4-H members, spend countless hours on their projects. Many people only recognize the animal projects however, each member has over 200 projects from which to choose. Pictured are (back row, l-r) Caden Hess, All About Beef; Sydney Shelton, All About Beef; Emma Yochum, All About Beef; Heather Burba, Marshall Stockmen; and Cameron Burkhart, Marshall Stockmen (third fow, l-r) Katie Cook, Greene Countrie Farmhands; Maddie Caldwell, Fab 5; Katelyn Chambliss, Highland County Unlimited; Kathryn Ogden, Canine Commanders; Kyah Chaney, K-9 Commanders and Fantastics; Alexis West, Marshall Jr. Farmers; and Madison Frazer, Fur, Feathers and Friends (second row, l-r) Hope Wyckoff, Barnyard Bunch; Spencer Wyckoff, Barnyard Bunch; Sydney Hamilton, Highland County Poultry, Pigs and Lambs; Claire Wilkin, Fur, Feathers, and Friends; Kelsey Thornburg, Fur, Feathers, and Friends; and Destinee Kipp, Fur, Feathers, and Friends (front row, l-r) Eve Roehm, Highland Harvesters; Leah Robinson, Marshall Stockmen; Mia Roehm, Highland Harvesters; Jayah Chaney, Fantastics; Lizzy Ogden, K-9 Commanders, Sam Hamilton, Highland County Poultry, Pigs and Lambs; Siarra Kipp, Fur, Feathers, and Friends; and Gage Thompson, Fur, Feathers and Friends.